Song lyrics have always been important to me. In college I was the girl that had the perfect song for the moment. Back then I would drag my jam box out from my bedroom and play what I thought was the perfect CD for the moment (because it was of course a million years before iTunes and iPods and playlists). From bad break ups (hello Alanis Morissette) to my life isn't exactly like I thought it would be (thank you Sarah McLachlan for understanding) to I just want to be me (amen Ani DiFranco) I knew the singers and songs with the right lyrics. Good lyrics mostly from strong women helped tell the story of my young life. From Madonna to Tori Amos, looking back I grew up with some great music and great lyrics. Singing the meaningful words over and over in my car or quoting the lyrics in my journal, the song lyrics comforted me. They made me feel less alone, more understood. I got a chance to review Mary Lambert's new album Heart On My Sleeve and I feel like shouting to whomever is in the room, "I've got the perfect song!" It's not just Lambert's melodic voice on the new music, it's the lyrics, the words she is singing. On Heart On My Sleeve Lambert sings about identity, dealing with pain from the past, finding love and being vulnerable and authentic. Some songs are slow and somewhat hypnotic like "When You Sleep," others have more of a pop/dancey feel like "Secrets." She even sings a haunting cover of Rick Springfield's "Jessie's Girl" and makes it her own. 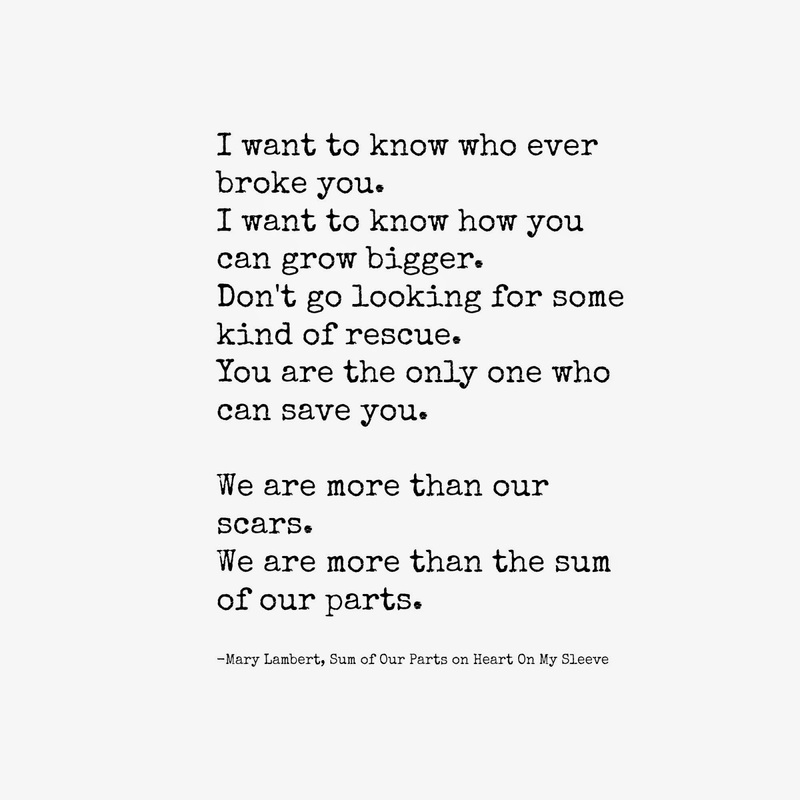 One of my favorite songs off the album is "Sum of Our Parts." It speaks to my inner lyric loving college girl. It's both slow and dancey. It's full of anthem-like lyrics about accepting ourselves and saving ourselves, lyrics I want to write in a journal or sing into a hairbrush. I don't want to really call her a voice of a generation because she spans generations. Her songs are relatable to 20-somethings and 40-somethings. Whether it's a group of my 40-something girlfriends getting together to discuss perimenopausal angst or my four kids and I baking together in the kitchen, I can find the perfect song for the moment on Mary's album Heart On My Sleeve. This is the perfect song ("Secrets") to dance along to in my kitchen with my kids. I love music and lyrics for the same reason. There really is a song for every moment. Love 'Secrets' - sounds like a great album! I totally got lost in her YouTube channel one day. She has a very cool voice. Good Lyrics are always important for any song producer. music should be good too. Heart on my sleeve have both of them very well. A nice song.